Is it just me or does the 4th of July almost seem like ages ago? Hard to believe we celebrated our Nations Independence just one week ago! Anyways, how are you all this fine day? I am hoping that everyone had a great weekend! Mine was low key yet packed full of fun activities! Dinner with Derek and friends Friday night, we tried out this new little (well not really little) tap house close to our home, a girls day in Stillwater on Saturday complete with a patio lunch and a walk around downtown, and finally Church Saturday night! Later today I am going to get a little family time in at my sisters Baptism! I am so proud of her for taking this next step to declare her faith in front of us and the Church! It is going to be a great evening! Did anyone else experience some insanely hot temps this weekend? Here in MN we got up into the high 80's with lots of humidity! Not my favorite weather, but hey its better then snow I suppose! For this weeks menu I am giving you a great meatless Monday meal, sharing with you a lightened up summer salad that goes great with any grilled meat, and throwing it back to one of my favorite recipes on the blog! 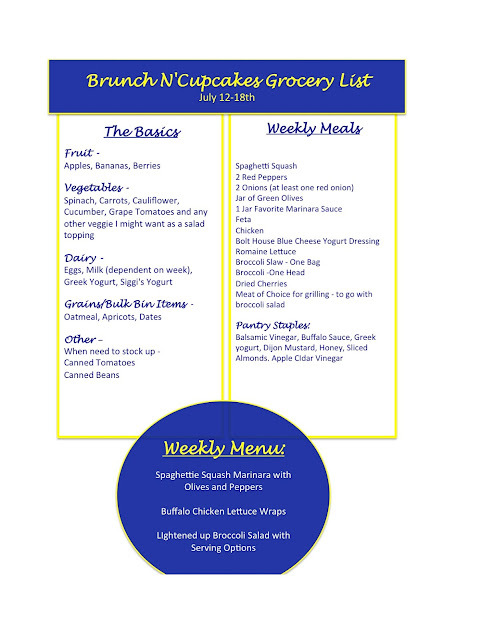 This weeks menu you won't want to miss... So let's dive in! and now... the shopping list! Enjoy, and have a fabulous rest of your weekend!